Over the last 3 or 4 years a new variety of blackberry has been the "talk of the town", it's called Reuben. Different from other varieties because it is bred to produce fruit on the current year's growth (a primocane) instead of the normal fruit appearing on the previous year's growth (a floricane). So far Reuben has been a great disappointment to most gardeners, producing weak growth and very few fruits. See the comments section at the end of this article which back up this conclusion from several amateur gardeners in the UK. Blackberries are well known for growing in shade and indeed they are one of the few fruits which produce a decent crop in those conditions. So if you have a rather shady spot in your garden / allotment where no other fruit will grow then blackberries are well worth a try. One reason for their success in cool, shady conditions is that the blossoms are produced later than for most fruit and they are almost never affected by frosts, even if grown in a frost-pocket. The ideal conditions though are in full sun where good root growth best occurs and the foliage can absorb energy from the sun. As far as soil goes, almost all conditions except chalky ground is suitable. Blackberries also need a free draining soil which can still retain some moisture. Do not plant them in ground which becomes water-logged. If your conditions are not ideal then choose a strong growing variety which is almost always a thorny one. If you have good growing conditions then you can plant the less vigorous varieties including the thornless types. When planning where to grow a blackberries remember that a single plant of the vigorous varieties can have a spread of 4m or more when fully grown. Avoid planting these bushes where wild blackberries or raspberries have previously been grown. Pests build up in the soil and these can affect new plants much more than established plants. Blackberries are self-fertile so one plant only is required for fruit to form. The blossom in May and June time is very attractive and a feature in its own right. You will find that it attracts large numbers of bees which is good for the plant and also for any neighbouring fruit and veg you have. 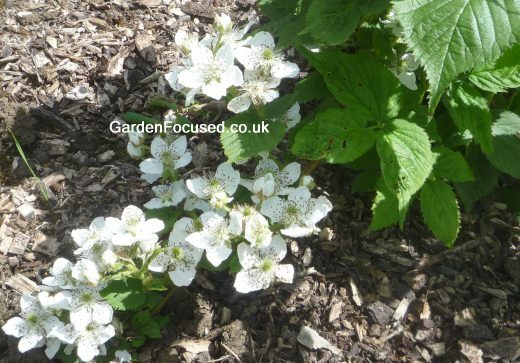 It's well worth researching the different varieties of Blackberry bushes available in the UK because they do span a significant cropping period, some are much sweeter than others and there are some thornless varieties. See our page on Recommended Blackberry Varieties for the UK. Blackberry bushes can be planted at any time of year although they will establish themselves best if planted in mid autumn to early winter. At this time of year the ground will still have warmth in it and at the same time rain at this time of year will be sufficient to ensure you can plant them and forget about them. If planting in winter, wait for a time when the ground is not frozen. If you do plant blackberry bushes from early spring to early autumn they will require watering initially in warm or dry weather. The key point to note when planting blackberry bushes (potted or bare rooted plants) is that the crown of the bush should be level with the soil surface. If you plant too deep the crown may well rot, if you plant the crown above soil level the bush may fail to establish. The crown of a blackberry bush is the point at which the roots and stems meet. With pot grown blackberries they should planted to the same depth as they were in the pot. For bare-rooted blackberries you will be able to clear a clear soil line on the stem which is the correct planting depth. Dig a hole wider and slightly deeper than the container or the spread of the roots on bare-rooted plants. Sprinkle a good handful of blood, fish and bone fertiliser in the hole and crumble some soil over it. Place the plant in the hole and crumble more soil around and over the roots. Make sure it is to the correct depth as described above. Gently firm the soil down with your boots to ensure no air pockets are left in the ground. Water well to settle the plant in the ground. Add a layer of mulch around the the plant, about 5cm / 2in deep and 45cm wide will be ideal. Don't let the mulch touch the stems of the plant. This mulch will not only suppress weeds it will also retain moisture in the drier months. If your bush is any taller than 40cm / 16in, prune the top (s) off to a height of 25cm / 10in just above a healthy looking bud. Use a sharp pair of secateurs to avoid crushing the stem. Make the cut slightly sloping to prevent any accumulation of rain water on the top of the cut stem. Pruning in this way will stimulate the plant to develop a good root system which will help it establish well. Blackberry bushes have a lifespan of many decades however the amount of fruit produced will start to decline after 15 to 20 years. At that point it's time to start thinking of taking cuttings /layering or replacing the bush. In recent years new varieties have been bred which have two key characteristics. They are thornless and not so vigorous. This makes pruning and supporting much easier compared to older varieties which regularly inflicted damage on hands and arms with their vicious thorns. To remove stems which have fruited earlier in the season. These will not produce well in the next season and removing them will encourage the growth of new fruit producing stems. To allow good air circulation. If the bush is not pruned it will become congested and fruits may be attacked by fungi. To allow sunlight to reach as much of the foliage as possible to encourage strong growth. To keep the majority of stems off the ground which will reduce the chances of diseases taking hold. To allow good air circulation for the same disease reduction reason. To assist in identifying new and old canes when pruning. To prevent damage from wind which can snap canes off at the base of the bush. Pruning blackberry bushes is easy in theory. When the bushes have stopped producing fruit, generally some time between August and October depending on the variety, cut all stems which have produced fruit that season down to the ground. Do not prune those stems which have not produced fruit, they will produce fruit in the next season. The reason behind this pruning method is that blackberries are biennial plants. Canes grow in one year and produce fruit the next year. Problems can occur with bushes which thorns on them because the pruning process requires you to reach over and under them. A good, strong pair of gardening gloves is absolutely essential for pruning thorny blackberries. Not only that but the thorns can make removal of the pruned stems very difficult. This is one reason that we recommend you buy thornless varieties, it makes pruning them so much easier. Supporting the stems also involves tying the canes into the supports. The simplest, and probably best method of support, involves hammering in wooden posts at two metre intervals, the posts should be about 1.8m / 6ft high above ground level. Then tie two rows of wire to the posts at 75cm / 2ft high from the ground and again just below the top of the posts. The strength of the posts and wire will depend entirely on how vigorous the variety is. For less vigorous plants such as Loch Ness two posts will be sufficient. For more vigorous varieties such as Himalayan Giant you may well need four posts. Tying the canes to the wires should start in mid June time and continue as the canes grow. Don't tie the canes too tightly because the will increase in width considerably over the next year or so. An annual mulch to a depth of 5cm / 2in will help retain essential moisture and keep most weeds away. Weed around the bush, if weeds get out of hand they can become very difficult to remove. If any stems spring up away from the centre of the plant cut them off. An annual application in May time of a couple of handfuls of blood, fish and bone worked into the surrounding soil will top up nutrient levels. Blackberries grow at an astonishing rate each year so a monthly feed of a nitrogen rich fertiliser from May to August will help them. We use a handful of Growmore each month. This is really a matter of trial and error, the timing will depend not only on the variety but also on the weather and growing conditions. For reference we quote a few varieties below with their average fruiting times. However, these dates can vary by as much as a month depending on the weather each year and it also varies depending on the climate in your area. The key factor for fruit production is when the blackberries produce their flowers. Expect flowers to be produced in late April to early May in an average year. Judging when fruit is ready for harvest is a rather hit and miss matter because colour is not always an indicator that the fruit is ripe. Blackberries are easy to propagate. In mid-September bend a healthy looking stem down so that the tip touches ground. Dig a hole about 15cm / 6in deep and place the stem tip in it. Cover with soil. You may need to peg the branch down if it tries to spring back up. Water well and retire for six months! In April next year cut the stem about 30cm / 1ft from where you buried it. If you dig up the new plant it can then be planted in a new position. Your chances of success? Almost 100%! You can also take blackberry cuttings in September. 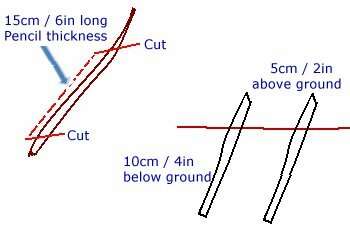 Cut a stem so that you have a section about 15cm / 6in long and about the thickness of a pencil. Trim off the thinner top part with a sloping cut. Dig a small area of the ground adding in some well rotted compost or multi-purpose compost. Place the cutting in the ground and fill in with dug soil so that 5cm / 2in is above ground level. Mark the cutting well so you remember where it is next year. Move the plant to its final position next April when it will have rooted well. See also the comments section at the end of this article (comment dated 9 March 2017) about taking blackberry cuttings at other times of year. Blackberries are one of the most problem free fruit plants. Only three problems of any significance might affect them. The first is bird damage although normally this is not sufficient to warrant any action. If they really do become a problem the bush can be netted. Blackberry Cane Spot can be identified as grey to black spots on the stems and occasionally on the leaves. If this occurs prune away affected stems as soon as possible to prevent the disease spreading. Mouldy fruit can sometimes occur and the cure is to increase air circulation by more severe pruning. COMMENT: In south Wales I have a blackberry bush growing out of my stone wall for 20 years, each year. It gives a great yield and the birds and bees love it, which gives me the most pleasure! QUESTION: Can anyone advise me on who I would have to contact concerning propagation rights for Loch Ness blackberries. That's probably the place to begin investigating. QUESTION: My neighbor hired out a clean up job on her property and the man clear cut my old, large, blackberry bush (20ft. long by 10 ft. wide) that was in full bloom. This was definitely going to be a bumper crop! I am crushed and worried about the impact on the plant. Can you tell me if this will kill it. It is generally very hardy and produces well yearly. The plant/bush has been there for more than 30 years! Help! 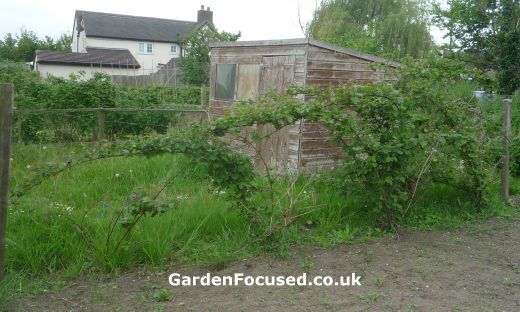 ANSWER: I am almost sure that it will recover, blackberry bushes are extremely tough plants. It will take a few years to reach it's former size though. My son grows blackberry Karaka Black and what I have seen it is a great plant for the home gardener. The berries are huge(10g+) ripening in early July and having a 6 to 8 week season. We once thought it had raspberry dwarf virus a few years back as the leaves went a sickly chlorosis yellowy green colour with green veins for a couple of summers(Boron/mineral deficiency? ), but after some judicious bonemeal and plant feed for a few seasons the plant's leaves are a very healthy green with no signs of any former disease. Having enriched balanced soil is the key to success in the fruit garden, because depletion will cause a plant to mimic signs of a known virus/disease e.g. yellow vein, calico virus etc. when it is nothing more than due to one's neglect. Karaka Black is also much more vigorous than those thornless types when established with yields after 3 years of 5 kg. Not bad for a trailing thorny type. Its thorns are softish on new canes, prickly later. Delicious tasting fruit. No mention of good old Merton Thornless! Classic English blackberry from the John Innes Institute developed in 1936. A bit out of favour now due to earlier cropping types being in demand more. Mine has been reliably cropping in the same spot for over 12 years. It has had only one bad year in that time due to some black gungey thing at the base of its canes (phytophera root rot?). after persistent torrential rain for weeks on end waterlogging its site which to be frank is not the greatest of places and that rain killed off loads of our other plants too in 2015, but it soon bounced back into full growth the same year. An indestructible, robust plant with the taste of real blackberries on quite short upright thornless canes for 6 weeks from mid/late August. The white flowers are beautiful too in June. The plant is hardy as well to about -23oC with good vigor. We collect 5 or 6 pounds a year from it. Great for pies or fresh eating. The kids love picking from it! The most successful commercial variety of all time must be Chester. In Europe and colder climes Black Satin is still grown for its hardiness which is close to Chester's. These old cultivars are largely superceded by much better flavoured varieties as all the older U.S types are very acid unless very ripe. Downside is that new breeding of plants has tended to sacrifice hardiness for this elusive sweet brix sugar/acid ratio of 10%+, with the exception of Loch Ness which may be the no1 commercially grown berry due to its hardiness but the flavour is very grassy. Taste a wild blackberry which has struggled with nature all year to grow and then a thornless I know which lacks flavour! Those newer US ones including primocane are just bland tasting beyond belief. 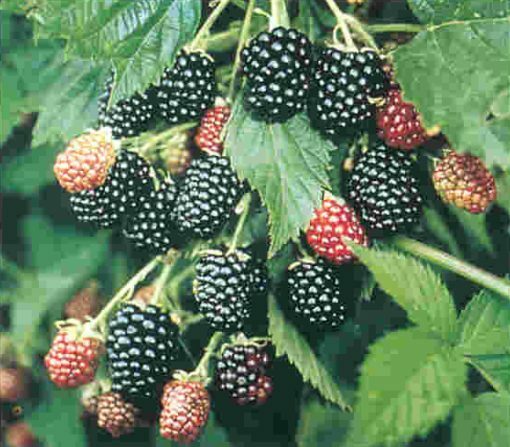 Boysenberry hybrid has the best taste of all and the blackberry Navaho a worthy second due to its sweetness, or the New Zealand berry Karaka Black which has a delightful ambrosia nectar like taste when ripe! Having grown BlackBerry Reuben and failed with it in the UK, I wonder why most major nurseries still sell it and give it great reviews after so many gardeners have given it the thumbs down even the RHS? All these primocane/double cropping blackberries developed in the US will not succeed in the UK or Europe due to climate. Agree with comments above about BlackBerry Navaho being best for the UK because of hardiness, productivity with sweet berries of a high sugar to acid brix ratio, with Loch Tay being a very close runner up. Karaka Black has huge delicious berries early season, but unfortunately is very thorny and is prone to disease like root rot or fire blight. I had grown it a few years back and its yield declined due to calico virus rendering the plant useless! Forget blackberry Reuben for the UK, a total waste of time, just not suited to our climate. Other American blackberries like Natchez are pretty useless too as it has a very poor leaf ratio problem causing cropping problem/cane development. Best garden blackberry is Navaho or newer clone Navaho Summerlong or Loch Tay.